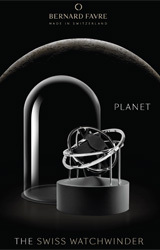 The 58th edition of the Salone del Mobile, Milano, has just ended on a high note with a record attendance of visitors, many of whom were able to discover a surprising new world: the one exhibited by Buben & Zorweg, a name that is fast becoming synonymous with luxury watch winders. Unveiled within the sophisticated ambience of its novel 140 square meter booth of the Salone del Mobile, Milano, Buben & Zorweg debuted the new Taurus, a safe with an outstanding design that catches the eye in any luxurious ambience, just like Orion and Galaxy do. But the newest member of the Buben & Zorweg watch winder safe collection does not rely exclusively on its good looks to make a mark. With regard to security, it premieres an amazing Buben & Zorweg patented armouring material! An essential technical revolution in the field of safes and safety. Known as protect pro, it is a composite of resin and stone, combined into a special material used in the body of the safe. Featuring a double argument, if on the one hand, the protect pro walls of the Taurus can withstand sophisticated attacks, on the other, they can reduce the weight of the safe by 30 per cent when compared to conventional safes. An outstanding technical performance while being attributed to a VdS security certification! Internationally known as the Milan Furniture Fair, the Salone del Mobile, Milano is far more than a fair or a large-size exhibition. It is a reference point for professionals in the design and furniture sector to create top-quality products. This year, more than four hundred thousand people, including designers, architects, journalists, collectors and design enthusiasts, from over 160 countries, attended the Milan Design Week. After all, the Salone del Mobile has the right creative environment for a brand like Buben & Zorweg to excel among the most recognised names in the world and to further establish a presence that, in the last few years, has become part of the exhibition itself. What is the best place for your watch winder? Watch winders come in all kind of designs, shapes and sizes. Choosing the best watch winder for your personal watch collection is quite easy. Most important is to think about what style you prefer, what your budget is and how many automatic watches you want to wind inside the watch winder. Another question, but important as well, is where you want to place the watch winder. Or maybe you prefer a watch winder you can take with you easily as you're travelling a lot? Most watch lovers have their automatic watches in or nearby their bedroom. When you wake up and get dressed it's very handy to quickly select the watch you want to wear that day. When the watch winder is nearby, for example in your bedroom or in a cabinet or walk-in closet, it will only take a moment and you're ready for the day. But placing a watch winder nearby your bed can also result in a little bit of sound, because the watch winder has mechanical parts inside (motor and gearbox). Some people sleep very light and cannot sleep with the sound of a watch winder nearby. For those it's better to place the watch winder a little bit away from the bed. Normally a good watch winder, for example from Buben & Zörweg, Benson or Paul Design, can be placed next to the bed because of their low sound level. Other watch lovers place their watch winder in their living room, as they love to see their automatic watches rotating. And we have to admit, that's a beautiful sight, especially in the dark when the LED lights enlight the watches. Placing the watch winder in the living room also means that you share your watch collection with other people, for example friends or family. But of course also with people you prefer not seeing your watch collection. We always advise, when you want to place the watch winder in your living room, to place it a little bit out of sight, especially that it cannot be seen from outside. You don't want to attract the wrong attention. From experience we know that a watch winder can be placed very well inside an office. It looks very nice and therefore catches the eyes of clients and collegues. Thereby placing the watch winder at the office is convenient, as you can switch your watch whenever you like at different occasions. And when your work is done, what is more relaxing then to look at a rotating watch? Of course we also have the watch adepts who like to have a watch winder with them during their travels, business trips and holidays. Then the watch winder must be compact, easy to take with you and not very fragile. These watch winders are mostly ment for one automatic watch and work on batteries as well. A good example of a brand which is specialized in this type of watch winders is Swiss Kubik. The Swiss Kubik watch winders are compact, nice and do their job perfectly. A watch winder can be placed anywhere. You just have to think about what spot you prefer and where the watch winder, and therefore your watches, is safe. Of course it's also important when the watch winder fits into the environment. It simply looks better! Most people who have automatic watches also want to have a watch winder to maintain their watches and keep them running so that they can wear the watch, without the need to adjust it, anytime. A watch winder is not only very handy but also good for your autmatic watches. The watch winder is a safe place to store watches all together, well protected against moisture and dust. But most important is to keep the watches running which ensures a good oil allocation within the movement. In short, a watch winder has different advantages! Watch winders are available in all kind of designs, capacities and materials. Of course price is an important factor. There are some watch winder brands which offer a great price/quality ratio. One of these brands is Benson, based in the Netherlands and for several years one of the most popular watch winder brands in Europe. 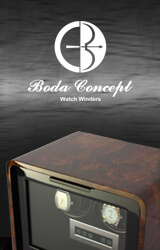 Since the launch of their Smart-Tech series in 2011 many watch adepts use a Benson watch winder. The Smart-Tech series is known for its quality and very affordable price. The nice thing about these watch winders is that they offer all functions you need to successfully wind your automatic watch. 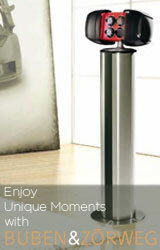 You can select the direction of rotation, turns per day and even control the LED light. Therefore the Benson Smart-Tech watch winders are suitable to wind any automatic watch, regardless brand or watch model. Good to know is that each rotor can be set individually, so you can place your entire watch collection in it to wind the automatic movements. In the middle of 2018 Benson watch winders launched the Smart-Tech II series. This new series is based on the Smart-Tech series from 2011, but has a more modern design and better technique. 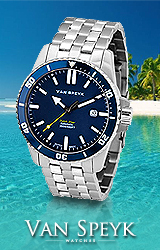 With a complete glass door the watch winders offer a great view on the rotating automatic watches. The drawer behind the glass door allows you to store extra watches or jewellery. The watch holders are suitable for all sizes of watches, big or small. The best thing about the new Benson Smart-Tech II watch winders is the unique price/quality ratio. We tested the Benson Smart-Tech II watch winders for several months and are still surprised about the quality offered for this price. Each watch winder comes with 2 years of international warranty, strong packaging and manual. Of course an adapter to use in the US, EU, UK or Asia is supplied as well. Are you looking for a great watch winder for an affordable price? Then you really should consider the Benson Smart-Tech II watch winders. You can buy them here.